Trojan-Enz lubricated condoms, with a special reservoir end. Made from premium quality latex. Straight shaft condom profile. TROJAN™ Sensitivity BARESKIN™ Lubricated Condoms are our thinnest latex condom ever and it's 40% thinner, has Silky Smooth Lubricant, premium low-odor latex to help ensure reliability and reduce the risk. Each Condom is Electronically Tested. Trojan BareSkin Sensitive Condoms, Trojan's thinest condom ever. Trojan Ecstasy Fire & Ice condoms with tapered/contoured fit and textured shaft for stimulating both partners. Dual action lubricant. Trojan-Enz Lubricated Condoms, with a special reservoir end. Made from premium quality latex. Straight shaft condom profile. 36ct x 4 Box. Trojan-Enz Lubricated Condoms, with a special reservoir end. Made from premium quality latex. Straight shaft condom profile. 3ct x 6 packs. TROJAN Her Pleasure Sensations Condoms are designed from a woman’s perspective to help heighten her sensation and pleasure while providing extra comfort for men. Ribbed and contoured for extra enjoyment & stimulation. 3ct x 6 packs. TROJAN Her Pleasure Sensations condoms are designed from a woman’s perspective to help heighten her sensation and pleasure while providing extra comfort for men. Ribbed and contoured for extra enjoyment & stimulation. Trojan Her Pleasures Ecstasy condoms with tapered/contoured fit and textured shaft for stimulating both partners. TROJAN® CHARGED™ Condoms are Deep Ribbed condoms designed for maximum stimulation. Made from premium quality latex and have Intensified Lubricant for both partners. 3ct x 6 packs. Trojan Magnum condoms are 15% larger than regular condoms. Tapered at the base for a more secure fit. Lubricated, with a special reservoir end. 576/box packed 48 x 12 packs. Trojan Magnum Ecstasy Ultrasmooth condoms with tapered/contoured fit and textured shaft for stimulating both partners. Trojan Magnum Condoms are 15% larger than regular condoms. Tapered at the base for a more secure fit. Lubricated, with a special reservoir end. 36ct x 4 Box. Trojan Magnum Condoms are 15% larger than regular condoms. Tapered at the base for a more secure fit. Lubricated, with a special reservoir end. 3ct x 6 packs. Trojan MAGNUM Thin Lubricated Condoms are larger than standard condoms and the thinnest MAGNUM condom available. Tapered at the base for a secure fit. Ultra-thin with comfort shape. 576/case packed 48 x 12 packs. Trojan Magnum XL condoms are 30% larger than regular condoms. Tapered at the base for a more secure fit. Lubricated, with a special reservoir end. 576/box packed 48 x 12 packs. TROJAN™ Pleasure Pack Lubricated Condoms features an assortment of stimulating condoms to provide sensual excitement for both partners. The assortment includes Twisted™, Her Pleasure™ Sensations and Intense & Warming condoms. They are made from Premium Quality Latex, Lubricated and Electronically Tested. 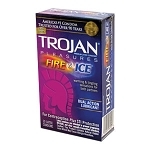 Trojan Pleasures Fire & Ice condoms with tapered/contoured fit and textured shaft for stimulating both partners. Dual action lubricant. TROJAN™ PURE ECSTASY™ Lubricated Condoms feature a revolutionary patented design that lets you feel the pleasure, not the condom! The condom has Ultrasmooth™ Premium Lubricant for a purely smooth experience and is tapered at the base for a secure fit. Trojan Sensitivity Thintensity Condoms are 15% larger than regular condoms. Ultra-thin with comfort shape. 576/case packed 48 x 12 packs. TROJAN® Ultra Thin Lubricated Condoms are Trojan’s thinnest latex condom designed for ultimate sensitivity, over 25% thinner than standard condoms. Made from premium quality latex and have a low latex odor. 36ct x 4 Box. TROJAN® Ultra Thin Lubricated Condoms are Trojan’s thinnest latex condom designed for ultimate sensitivity, over 25% thinner than standard condoms. Made from premium quality latex and have a low latex odor. 3ct x 6 packs. 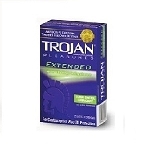 TROJAN™ Stimulations Ultra Ribbed Lubricated Condoms have deeper ribs on the condom. Made from Premium Quality Latex, Silky Smooth Lubricant, Special Reservoir End and each condom Is Electronically Tested. TROJAN® Ultra Ribbed Lubricated Condoms have deeper ribs designed for ultra stimulation. Made from premium quality latex and have Silky Smooth Lubricant for comfort and sensitivity. 3ct x 6 packs. TROJAN™ SUPRA™ BARESKIN™ Lubricated Condoms are America’s Thinnest Non-Latex Condoms – recommended for latex sensitive people. The condoms are designed to transmit natural body heat and are super thin, yet strong and made from clear, odor free, medical-grade polyurethane. Trojan Supra BareSkin Lubricated. Latex-free for those with latex sensitivity. Ultra-thin, clear and odorless. Micro-sheer Polyurethane.